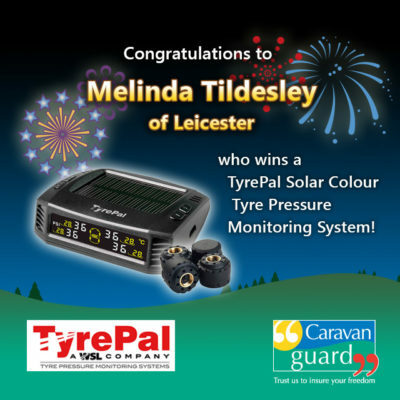 Congratulations to motorhome owner Melinda Tildesley of Leicester, who has won one of TyrePal’s new Solar Colour tyre pressure monitoring systems for her Swift motorhome. She was the lucky winner drawn from more than 1,500 entries into our giveaway competition, which marked the launch of TyrePal’s new Solar Colour tyre pressure monitoring system (TPMS) at the end of last year. It helps to improve safety and reduce fuel consumption in motorhomes and other passenger vehicles by monitoring the pressure of all four tyres simultaneously. It’s also the first TyrePal product to be equipped with a driver-friendly colour monitor and costs £109.99. Thanks to everyone who entered the competition and to find out more about this and TyrePal’s other pressure monitoring systems visit the TyrePal website. If you enter GUARDTP2 at the checkout then you’ll also get a 10% discount on their monitoring systems. Please note that this code not available on products which are already discounted. Plus, don’t forget that you’ll get a five per cent discount on your motorhome insurance if you have a tyre pressure monitoring systems fitted to your motorhome tyres. Look out for more giveaway competitions on our news home page.